Scientists have described whale sightings off the Cornish coast as one of the "largest gatherings" of the species ever seen in British waters. 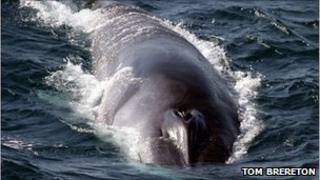 Researchers spotted 21 fin whales 50 to 70 miles offshore, feeding near the surface over 30 minutes. The fin whale, the second largest animal on the planet, is a globally endangered species. Dr Tom Brereton, research director from Marinelife, said it was an "incredibly rare event". The species were seen in an area known as the Celtic Deep, between north Cornwall and south west Pembrokeshire, on 21 May while researchers were on a three-week cruise in the area surveying numbers of schooling fish such as sardines. The survey is due to finish on Thursday. Dr Brereton said: "It is very unusual to see those numbers, historically it's never occurred in that area. "In the last 10 years there's been one or two sightings that have cropped up off the coast of Wales and Cornwall which has been quite big news, but to see 20 more or less together in one small area is really fantastic." Fin whales are usually found in large numbers in the Bay of Biscay, but their presence in British waters is a relatively new discovery. Experts on the ship suggested that the whales may have been chasing a dense crowd of krill into the area. Dr Colin MacLeod, Marinelife's chief scientific adviser, said the sighting could be part of a wider movement of sea creatures around Britain's coast as a result of climate change. "These changes indicate the extent to which climate change is affecting our marine animals. "If it is affecting these top predators to such an extent, it is likely that it is also affecting other marine life further down the food chain, including species which are commercially important for the fishing industry," he said. Marinelife is a charity working to study and maintain numbers of whales, dolphins and seabirds around the British coast.